Maria Treben's book contains comprehensive instructions and sought-after personal advice from Europe’s most popular herbalist on the use of medicinal herbs. 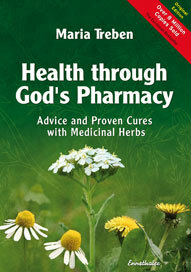 She explains time-honored herbal remedies that have been shown to cure even some so-called “incurable” diseases. The author, Maria Treben, was herself a highly acclaimed and much sought after lecturer in Europe. Wherever she spoke, the auditoriums were filled to overflowing with enthusiastic crowds eager to hear the enormously successful herbalist tell of her personal experiences in treating and relieving even malignant diseases with her completely natural herbal remedies. Available in: English, German, Spanish, Polish, Russian, Greek, Italian, Hungarian, Czech, and French.